This time of year you can see snow-capped mountains from Rome. Monte Terminillo stood 70km away as we drove up Rome’s outer ring road, in the northeast corner of Italy’s Lazio region. It would have been a fairly innocuous bump on a mountainous horizon were it not for the snow. Now the white glaze caused it to stand out from its neighbours. We didn’t know it was Terminillo when we first saw it, but it remained in front of us for almost our entire journey, and eventually we were certain it was our destination. As we approached the town of Rieti its jagged outline pushed up against the sky in the form of a flat ridge plastered in white. It was exciting to be starting our winter walking as early as November. 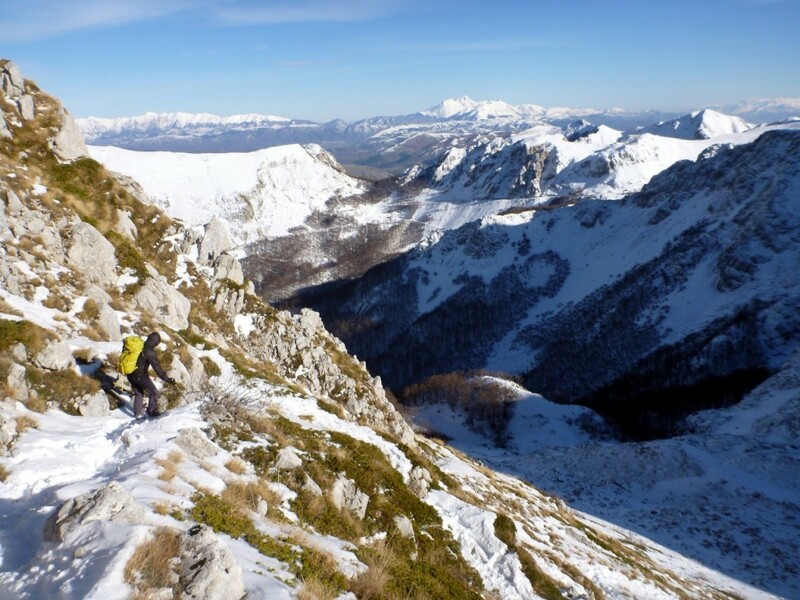 The higher peaks of the Apennines will remain snow clad until April or May, allowing us to repeat many of the peaks we climbed this year in very different conditions. 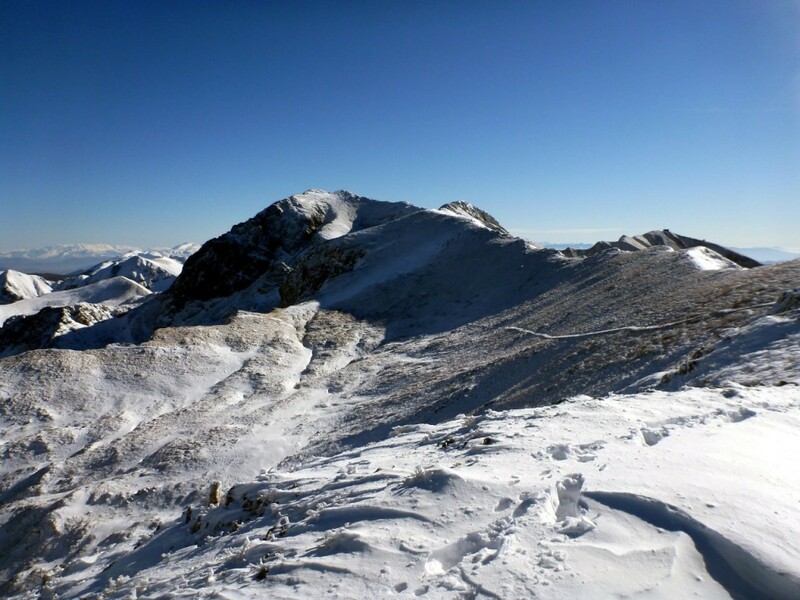 At 2217m Monte Terminillo isn’t the highest mountain in Lazio – that prize goes to 2458m Monte Gorzano not far away on the border of Abruzzo – but it’s only an hour and a half’s drive from Rome and is much more accessible. A road cuts across its eastern flank all the way up to 1850m, and there is a ski resort on its southern side. 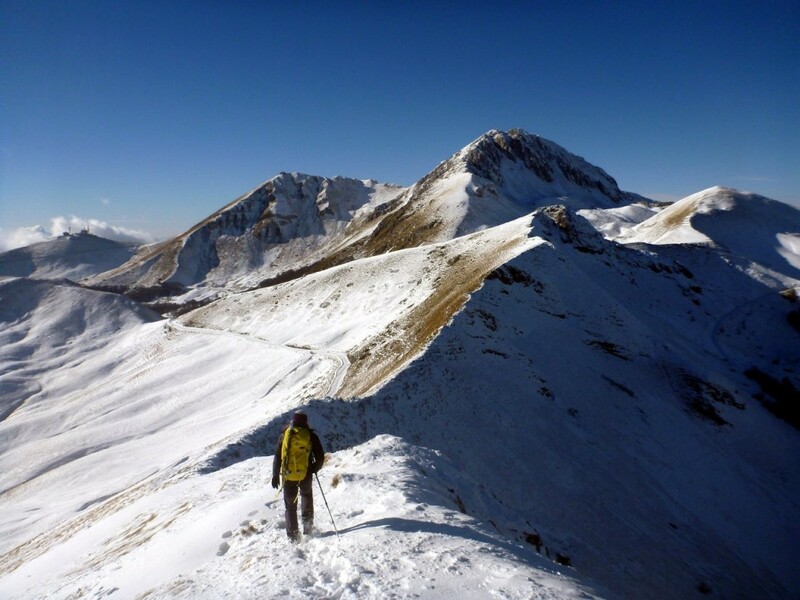 Unusually for the Apennines it is also a popular venue for winter mountaineering. Its northern face has a series of steep gullies which in the right snow conditions provide alpine climbing grades of PD and AD. We were there for the winter walking rather than climbing, and were equipped with nothing more technical than crampons and walking axes. 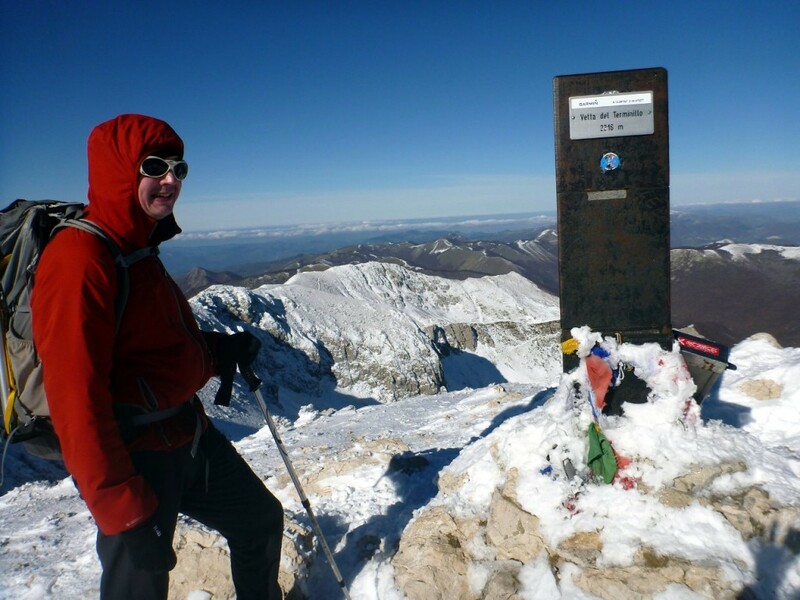 We’ve started working our way through the 249 summits in Italy classified as Apennine 2000ers; Terminillo and its neighbouring peak Monte Elefante were about to provide six more. Although the Apennines are criss-crossed by tarmacked roads in unlikely places, you can never be sure whether they’ll be open after snow has fallen. The road up from Rieti climbed through forest for nearly 1500m in sharp zigzags. It was a surprisingly good road, but there were patches of ice as we reached the ski resort of Terminillo, and when we came across a layer of thick snow beyond the car park at Pian de Valli, we decided to park up and walk. It was a beautiful crisp, clear day, but quite windy. The forecast was slightly better for Sunday, so we decided to make Saturday’s walk a short recce of the area to scout for the best route up Terminillo the following day. It took little over half an hour to walk up the road to Rifugio Sebastiani, the hut at 1820m where we’d intended to park. 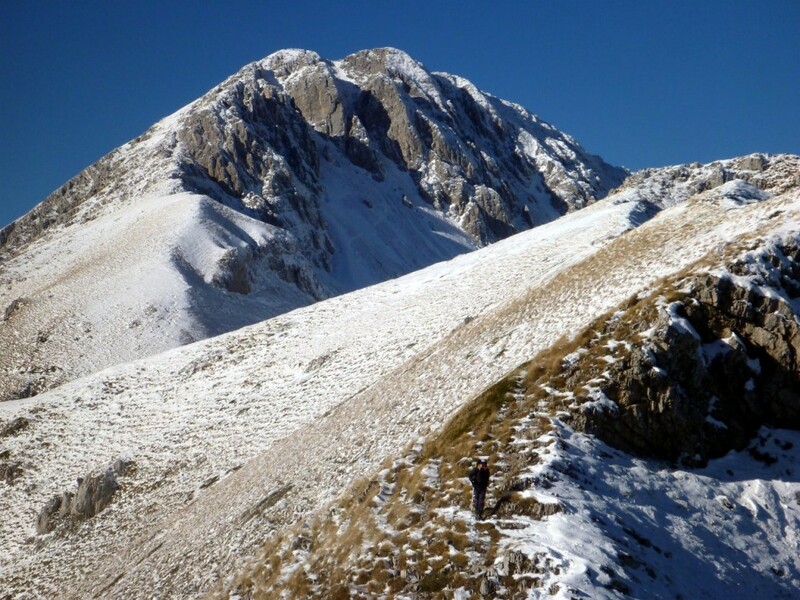 There was a great view of the north face of Monte Terminillo from a col just above the road, a jagged dome with half a dozen couloirs spilling down. Via normale for hikers was the eastern skyline, a straightforward snow plod with only 400m of ascent. We needed something a bit longer and more exciting for our walk the following day. 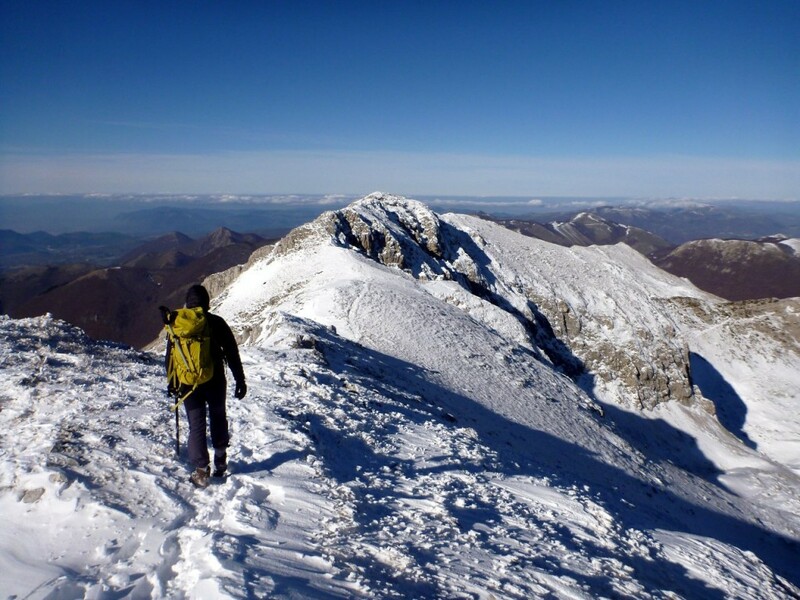 From the col we had a one-hour walk along a ridge to the summit of 2015m Monte Elefante. Edita experimented with crampons to begin with, but the snow was soft and light, and there were still many patches of bare rock. We both found it quicker in just our boots, and she took the crampons off again after only a few minutes. The ridge was steep on the left-hand side, with a picturesque view down into a forested combe. Monte Elefante formed one wall of the combe, and our ridge gradually curled up towards its summit. To our right the land fell away more gently to a cycle track about 100m below us. There are signs of civilisation all over the Terminillo massif. We could see a hut on the summit of Monte Terminilletto, Terminillo’s sister peak, and the peak beyond it had a giant aerial on its crest. We passed several hotels, deserted this early in the ski season, during our half hour walk up the road, and there were a number of cars parked just below us. The setting was far from remote, but the accessibility of a place such as this is one of its attractions. 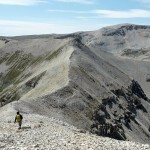 There were many people out enjoying the wide mountain views, but we seemed to have this particular ridge to ourselves. The view from the summit of Monte Elefante didn’t disappoint. Once again we were able to pick out many peaks we have ascended this year, all of them snow clad. The Simbruini and Sirente-Velino peaks were closest to hand, with the plateau-like Maiella range far behind. Most prominent of all was Corno Grande, as usual, but it had a very different appearance this time. At 2912m it’s several hundred metres higher than most of its surrounding peaks. Usually we’ve seen it from the south, where it has the appearance of a dramatic rock tower. From the west, partially shielded by the neighbouring peaks of Monte Corvo and Pizzo d’Intermesoli, it appears as a giant snow massif. 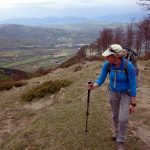 North of it were two more subranges, Monti della Laga and Monti Sibillini, but to our west – Monte Terminillo aside – the land was very much lower, though nowhere flat. We wandered over to the summit of 2004m Monte Valloni. How this peak qualifies as a separate 2000er I haven’t a clue. It’s separated from Monte Elefante by little more than 100m, and to get from one to the other requires a drop of about 5m. We duly ticked it off, had a sandwich in the col between the two peaks, and returned the way we came. The following day we parked in the same place in the car park at Pian de Valli, and took the long route up Monte Terminillo via its sister peak Monte Terminilletto (2105m). As we traversed up its flanks we had a long view up the valley we walked the previous day, and kind of understood how Monte Elefante came by its name. A little imagination was required and Edita spotted it before I did, but it did bear a passing resemblance to a sleeping elephant, with Monte Valloni forming its broad back, the ridge we traversed looking like its flapping left ear, and the mountain’s steeper northern side its crumpled face and trunk. You can judge the photo for yourself, or just tell me I’ve been drinking again. The trail crossed a col and came up Terminilletto from the far side. The town of Rieti took up only a small portion of the wide valley 1500m beneath us. As we drove up the road the valley was filled with a blanket of low cloud which made it look like an eerie grey lake, but now the clouds had dispersed it was clearly a grassy plain hemmed in by small hills. We reached the hut on the summit of Terminilletto after only an hour of walking and took photos on its paved balcony which resembled an ice rink. The hut was boarded up and we didn’t linger. 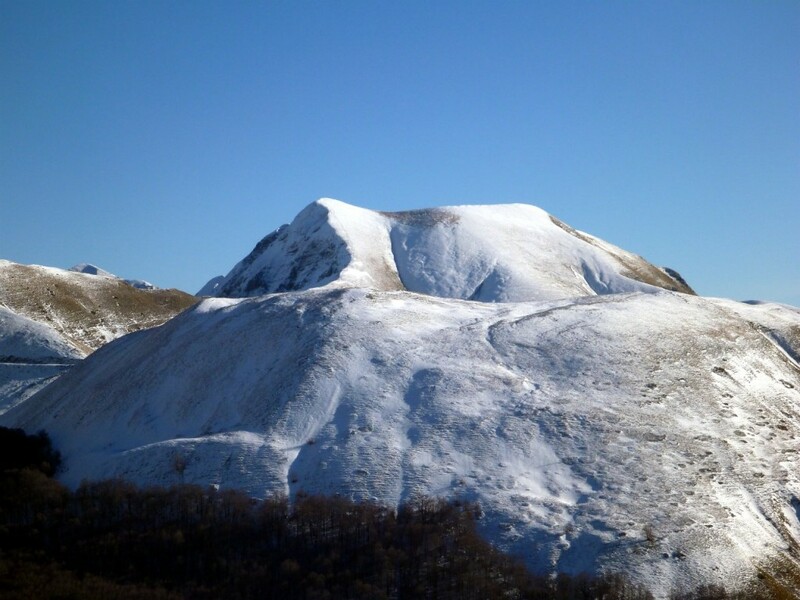 An undulating ridge led to Terminillo, broadening into a snow slope as it approached the summit. In contrast to the gully-ridden north face, the snow on this side of Terminillo had formed into deep drifts, and as we approached the summit we found ourselves following knee-deep footprints. I found it surprisingly hard work. The summit was marked by a giant Toblerone thrust into the snow (or a triangular prism if you prefer). The view from the top was one of the widest we have experienced anywhere in the Apennines. This may be because Terminillo is relatively isolated compared with other peaks we’ve climbed. Geographically it’s not far from being the middle point of Italy, and the Tyrrhenian and Adriatic Seas were more or less equidistant. We had a grandstand view of the main ranges to the east – the same as we had seen from Monte Elefante the previous day – with nothing but rolling hills to the west, all the way to the sea. On the way up from Terminilletto a young lad had overtaken us wearing jeans and trainers. He carried no backpack or walking stick, and we watched him virtually crawling through the deep snow that had tired me on the way up. Now he was flopped on the summit, exhausted. We stepped between Terminillo’s two summits to ensure we had been to the higher one, and by the time we left he was still there. But I was in no position to judge him for tomfoolery. It had taken us only two hours to reach the summit, but already I found myself running out of energy and shivering with cold. I put this down to our standard Italian breakfast. These consist of chocolate croissants, sticky buns, sweet cakes, biscuits and sugary cappuccino. I don’t have much of a sweet tooth, so I ate very little. When I put this theory to Edita, she was sceptical. She told me it was probably down to the red wine. We polished off two bottles between us in a restaurant the previous evening. But the phrase between us is misleading, as I’m pretty sure Edita didn’t drink her fair share. 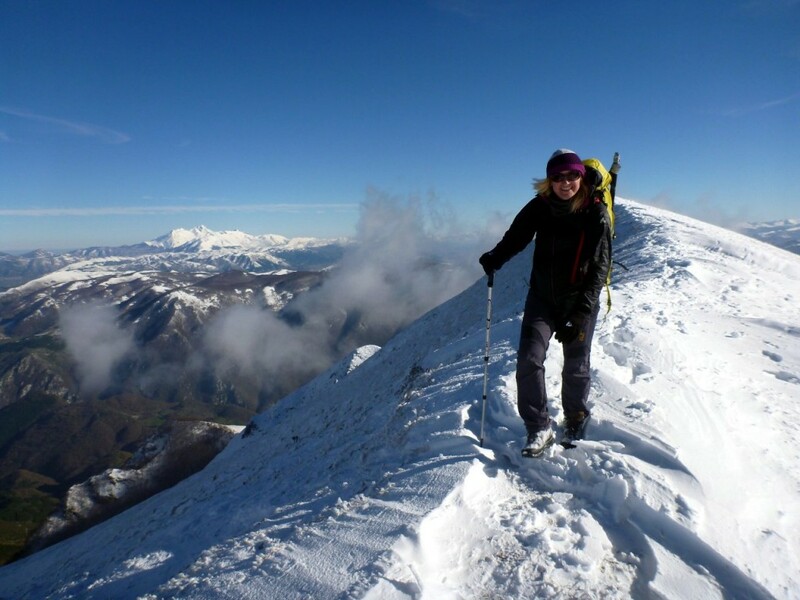 A wind lashed across us shortly after we left Monte Terminillo’s summit and she shot off down the ridge. I had to call her back so that I could stop to put on extra layers and eat some chocolate. We followed Terminillo’s northwest ridge over two more of the Apennine 2000ers, Vetta Sassetelli (2139m) and Cima di Vall’Organo (2080m). Like Monte Valloni, they were about as prominent as a hobbit in a dwarf identity parade, and it’s stretching reality to consider them separate peaks. But they are on the list of 249 and we added two more ticks. It was a pleasant ridge, rendered more picturesque by the snow cover. The first section, over Vetta Sassetelli was rocky, easy scrambling. After the peak the ridge broadened and dropped to a col where we came across a junction of paths. A track dropped into the lowlands to our left, but the waymarked trail no. 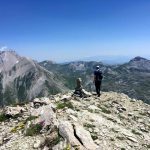 403 that we were following doubled back and dropped down to traverse the northern flanks of Vetta Sassetelli and Monte Terminillo. This latter path was our route back to the car, but before we took it we walked a little further along the ridge beyond the col to Cima di Vall’Organo, where there was a small cairn, and we had a last view of the ridge we had followed, back to Monte Terminillo and the massifs of Gran Sasso, Monti della Laga and Monti Sibillini. Edita took the lead as we descended the 403 trail to Rifugio Sebastiani, from where we’d climbed Monte Elefante the previous day. The signpost at the col informed us that the hut was an hour’s walk away, but it took us much longer in the winter conditions. We had to break trail through soft powder snow as we dropped beneath the col. Then a spectacular high trail traversed around two secluded combes. The conditions were the closest we came to winter mountaineering that weekend. The paint marks indicating the trail were hidden beneath snow, but enough people had been that way to leave footprints for us to follow. Usually these were deep boot prints we could step into, but a couple of sections of firmer snow required more care. 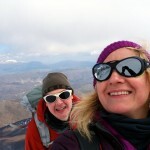 We managed it without resorting to crampons, though I swapped my trekking pole for an ice axe as a precaution. Edita was more confident, and I had a hard time keeping up with her. Conditions eased as we traversed beneath the couloirs spilling down the north face of Monte Terminillo. Finally the trail dropped down to Rifugio Sebastiani, and we returned to Pian de Valli by walking along the road. 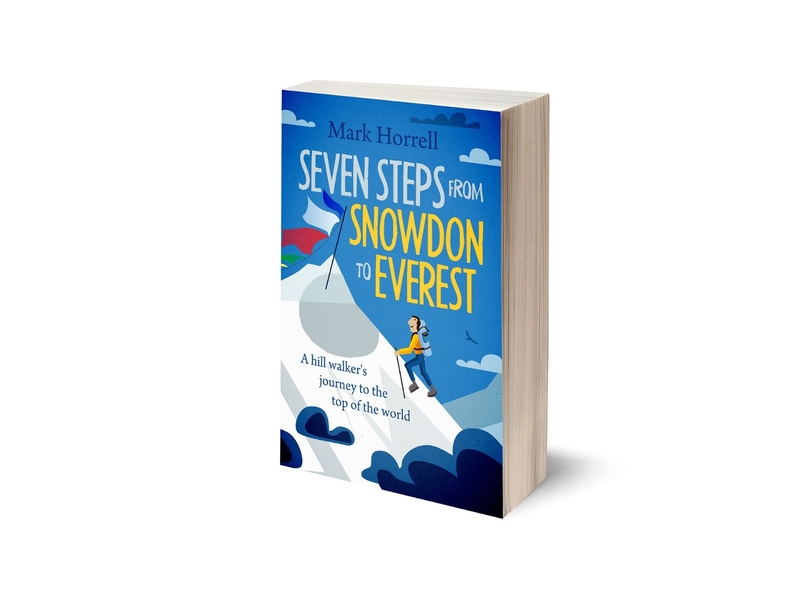 It was a straightforward six hour winter walk, with a couple of more interesting sections that would have provided a good introduction to winter mountaineering. The views were amazing, and it will be a good place to come back to for some real alpine climbing when more snow has fallen and consolidated on the north face. I will remember 2015 as the year that I discovered the Apennines. 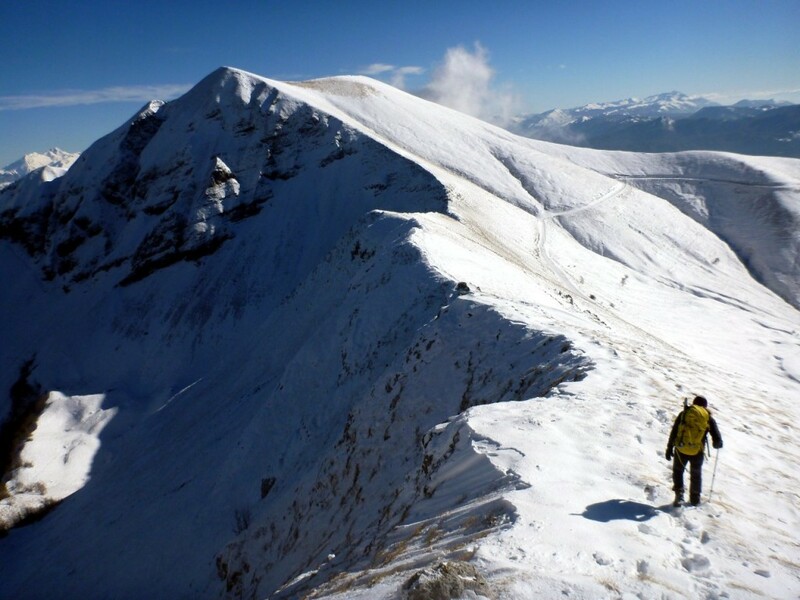 In the course of climbing 25 of the 2000ers, we have experienced proper winter mountaineering, enjoyable grade 1 scrambling, gentle ridge walking in summer and winter conditions, forest hikes, grassy moorland, Scottish-style misty summits, rocky moonscapes, pleasant valley walks, and narrow gorges squeezed in between precipitous cliffs. And we’ve still only scratched the surface. I can’t wait for more. You can see all of my photos from our Terminillo weekend starting on p.6 of my Italy 2015 Flickr Album. If you’ve missed any of my Apennines trip reports and are interested in reading some the others, you can see a full list of blog posts tagged with apennines. Maybe a sleeping elephant made of snow who’s started to melt a little. I can see that.